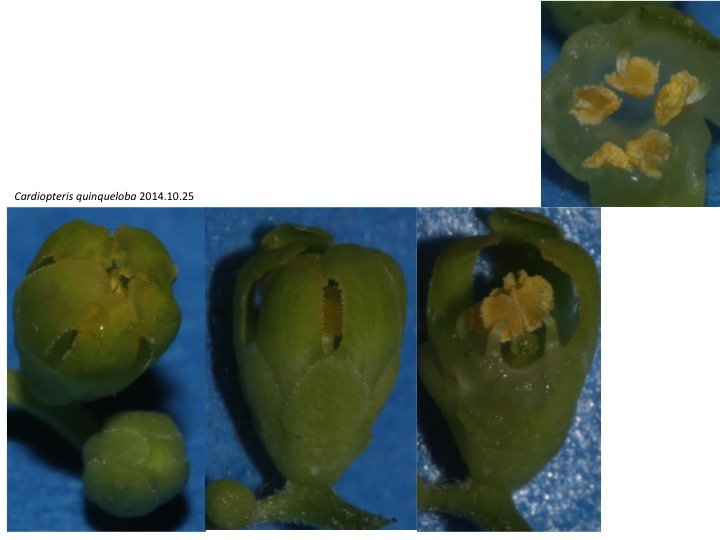 Species in the Cardiopteridaceae has ovules composed of two carpels, one of which has fertile stigma. The sterile stigma is much smaller than the fertile stigma. 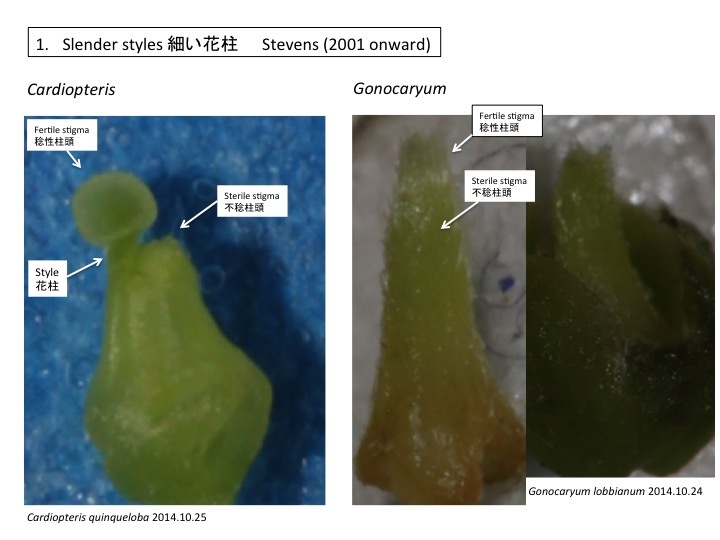 The sterile style elongate after the fertilization of the fertile carpel in Cardiopteris, but not in Gonocaryum. 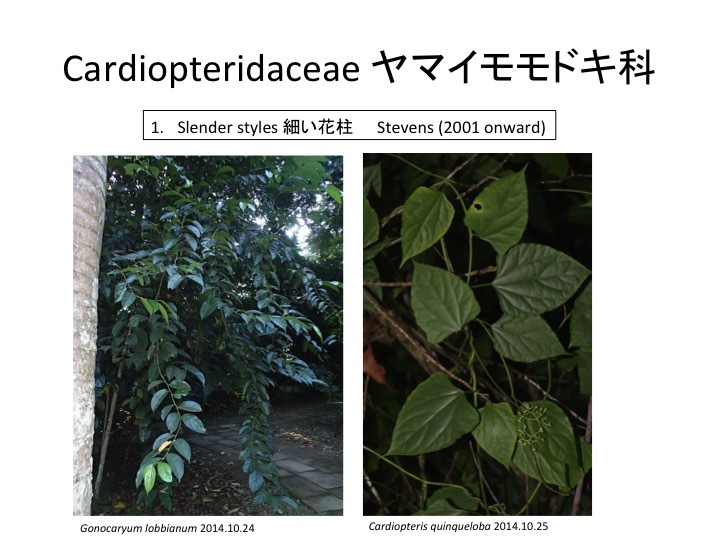 The style of the fertile carpel becomes slender in Cardiopteris quinqueloba but that does not in Gonocaryum lobbianum. Goniocarpium lobbianum forms ridged fruits. It is unknown whether these ridges are formed with the similar developmental program used in the wing formation in Cardiopteris. Leaves of Cardiopteris quinqueloba changes their morphology, which is called heterophylly. 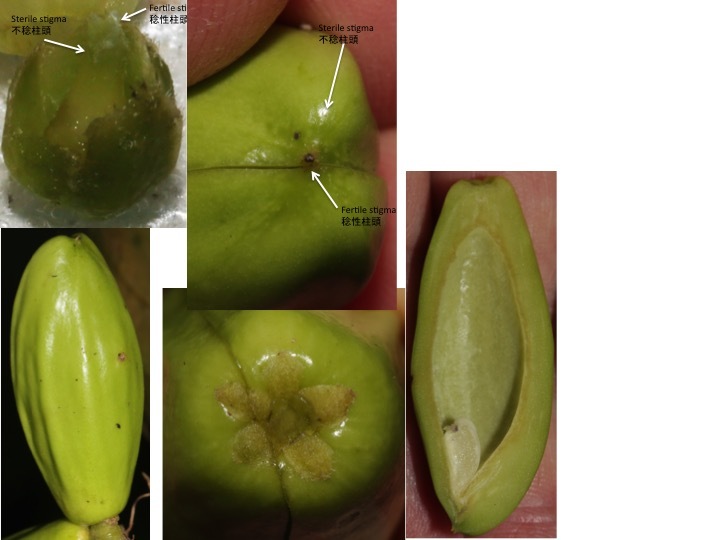 As in other heterophylly, the morphological change is not completely gradual but there is a kind of threshold of morphological changes. The gap between different morphologies is a still remaining question in evolutionary biology, especially when we explain macro evolution. 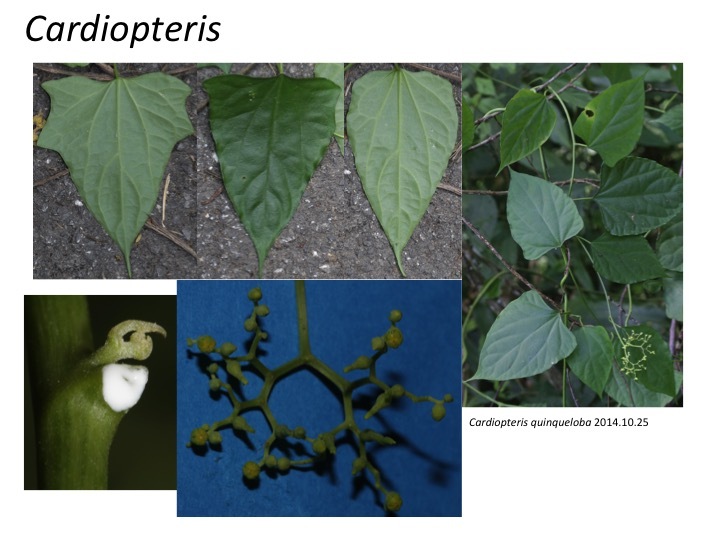 Cardiopteris forms two carpels, one of which is fertile with functional stigma. 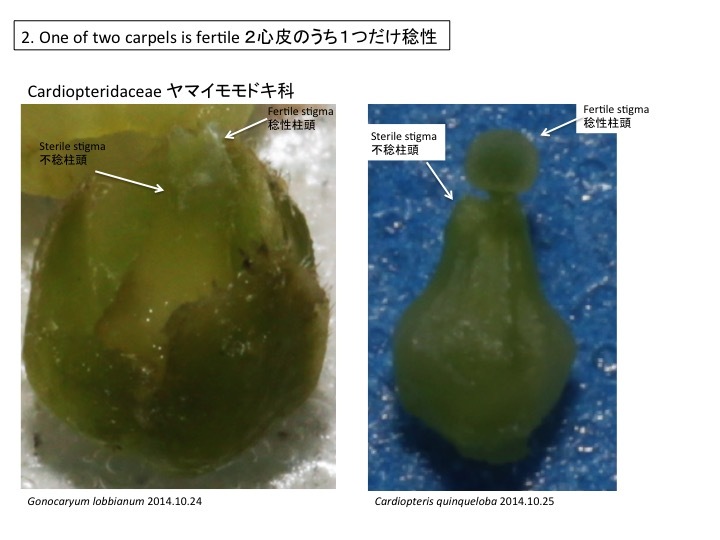 After the fertilization of the fertile carpel, the style of the sterile carpel elongates and becomes fresh. This may function as an aril (Tobe 2012). The fertile carpel forms wings in right and left directions. Wings of the ovary are formed by intercalary growth, but it is unknown how such growth is regulated. Carpels are an leafy organ but much more variable than leaves. In addition to the adaptive significance, there may be mechanistic reasons for the morphological diversity. 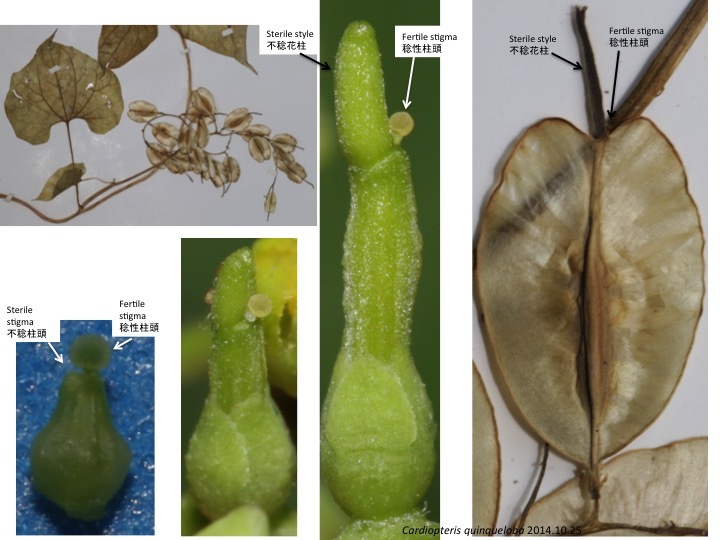 For example, interactions to ovules and other carpels, which do not occur in leaf development, may be related. 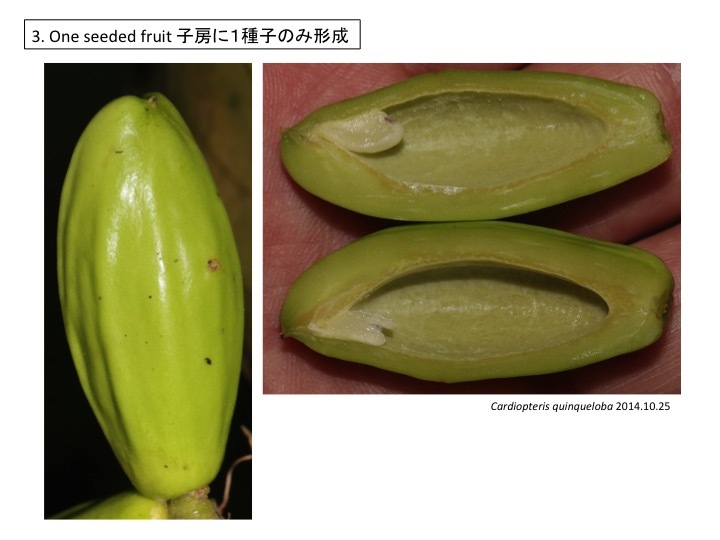 Also, fruits form characteristic secondary metabolites, which may be related. Relationships between metabolome and development are a challenging field in developmental biology. Tobe, H. 2012. 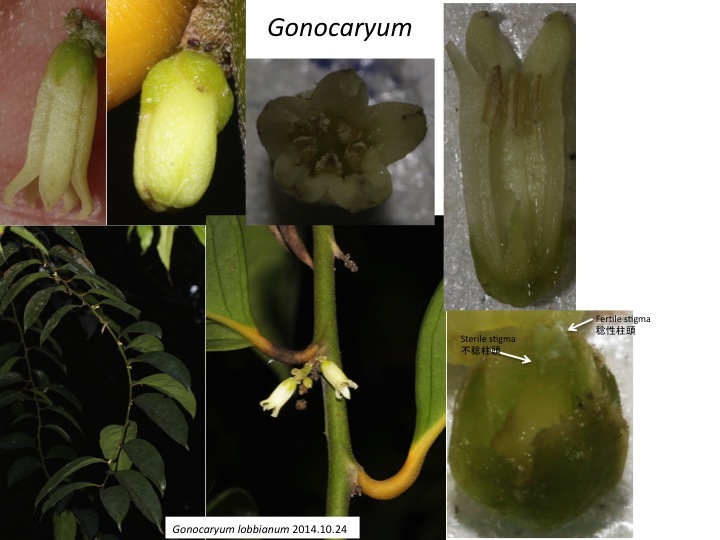 Floral structure of Cardiopteris (Cardiopteridaceae) with special emphasis on the gynoecium: systematic and evolutionary implications. J. Plant Res. 125: 361-369. 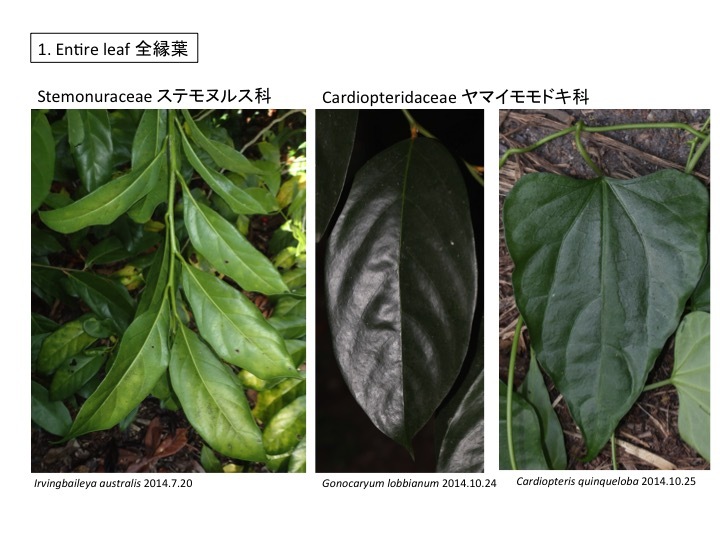 Hi, dear Mitsuyasu, I am very glad to see your new lecture notes mentioned the plants we saw in YUNNANG! Thank you for showing your appreciation here. It is our great pleasure to observe plants with you together. The professional young Dr. Yunhong Tan gave us really great help. I forgot to tell you that Tan is his family name. 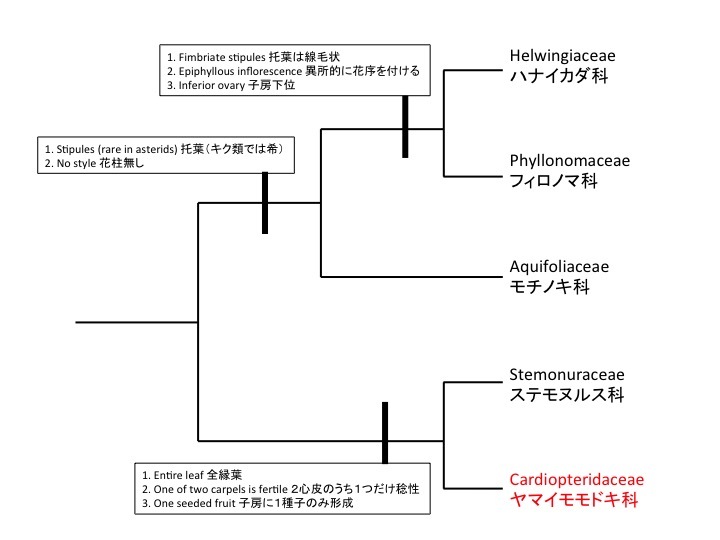 The fleshy sterile stigma of Cardiopteris quinqueloba is quite interesting. 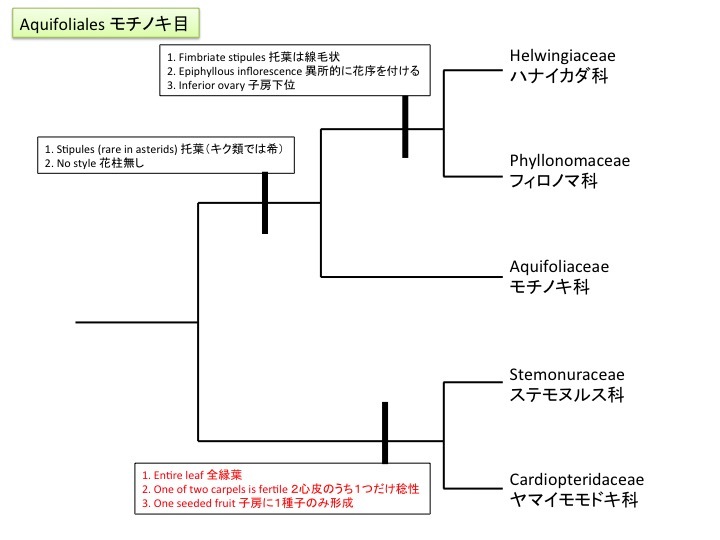 基礎生物学研究所生物進化研究部門の長谷部光泰が作っている「植物発生進化学」の講義録です。Lecture notes of "Plant Development and Evolution" by Mitsuyasu Hasebe at National Institute for Basic Biology (NIBB), Japan. 非商業目的には、使用者の責任の元、ご自由にお使いください。Free use only for non-commercial purposes with your own responsibility.